Finished getting groovy with the Genesis version of Earthworm Jim? Done with the Special Edition on the Sega CD and looking for more? Why not check out the Game Gear version? It may not have all the levels and visual power of its 16-bit cousins, but it’s worth checking out, for a while at least. The princess will thank you for it! You’re probably going to take interest in the announcement that new Earthworm Jim games are in development for handhelds! Which ones and what games have yet to be revealed, but Atari is brining the annelid hero back in a big way next year. Check out our preview for more details. Shiny created a star with Earthworm Jim, and the character went on to become one of the most recognizable heroes of the 16-bit era. There’s good reason for that too, as the 2D games in the series defined the fusion of excellent gameplay and stellar presentation. In 1994, David Perry and Doug TenNapel created a platforming icon. 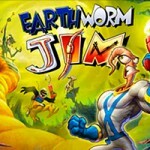 Earthworm Jim was a huge hit, and he has since gone on to appear on a myriad of platforms. Sega-16 takes a look at how the famous annelid got his start and where he’s headed in our latest History of article. Come on in and get groovy! Like Earthworm Jim? Aladdin? Global Gladiators? If so, then you undoubtedly know their creator. He’s been at the forefront of game development for years, and was able to make the Genesis do some incredible things. I am, of course, talking about David Perry, and sega-16 has an exclusive interview with him. Enjoy!